Opposition leaders Tendai Biti and Nelson Chamisa (file photo). Former Finance minister Tendai Biti's Zambian lawyers will challenge the neighbouring country's decision to deny him political asylum after he was deported last week in defiance of a High Court order. The MDC Alliance co-principal's lawyer said they would pursue the issue in which the former Zimbabwean finance minister was seeking political asylum in the courts. "We are at the High Court to notify the court that the Zambian government defied a court order and deported Biti back to Zimbabwe," Phiri said. "It's pathetic that the Zambian government can summon about 100 police officers and soldiers to accompany a defenceless individual back to the Zimbabwe side. It's a shame. "Such disregard of human rights should not be accepted in this age. We informed Judge Yangailo about the defiance by the government and they will soon hear the case." 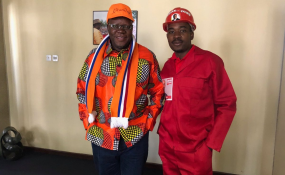 Biti told reporters the day after the July 30 vote that the opposition couldn't account for 21% of the tally sheets that by law were supposed to be posted outside polling stations, but "from what we have received, it's clear we've won". He split from the MDC after it was defeated in another contested vote in 2013, before reuniting with the alliance last year. -- Additional reporting by Bloomberg.